Judging by the number of users reaching this site through Google searches for 'Davenport squash championships' (or something similar), it appears that the tournament is generating a great deal of interest. The Super Series tournament is being held at the University of Richmond's Millhiser Gym, and the 32-man main draw has moved into its second round, with results largely going to seeding. With the recent announcement of the Players Cup Series web streaming, the relocation of David Palmer to Boston (following a similar move to the US by John White) and Natalie Granger strengthening the women's game in the country through a number of recent tournament wins there, 2008 looks set to be a significant year for squash in north America. 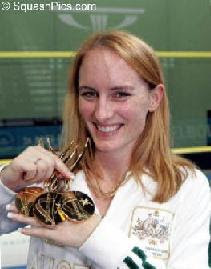 Natalie Grinham announced today that she was switching her nationality from Australian to Dutch. Her comments on Squashsite explain that the decision was due to her long-standing residency in the Netherlands, and marriage to Dutch player Tommy Berden. "I'm looking forward to being able to represent Holland so that I can give back something to the country that has helped me improve so much". Is this a veiled swipe at Squash Australia? It was in in the build up to the 2006 World Team Championships in Edmonton that both Natalie and her older sister Rachael decided to not participate due to what they saw as a flawed selection policy. The quarrel was not about the individual support she had received - rather the perceived injustice at the most worthy players not being picked for the team at the time. Grinham's explanation for relinquishing her Australian eligibility does refer to this episode in particular, but it does lead one to speculate as to whether is was a contributing factor. Natalie has had success in recent years wearing Australian colours, picking up 3 gold medals in the 2006 Commonwealth Games in Melbourne. The change of nationality is particularly good news for women's squash in the Netherlands, with 9 women now inside the top 100 of the WIPSA rankings. "We understand Natalie's reasons for choosing to represent the Netherlands, although we are obviously disappointed to lose a player of her standing from the Australian ranks." The changing of nationality echoes Peter Nicol's move from Scotland to England, and it will be interesting to see if any fallout renders it as controversial. Production and delivery of the programming will be the product of Jean DeLierre and his team at Telimage - well known in squash circles for their high quality TV productions of squash events over the years and for his squash DVD business at www.squashlive.com. In yet another first for squash, DeLierre will be employing cutting edge peer-to-peer web delivery technology to enable 1 million + viewers to tune in to the programming at www.squashlive.com simultaneously without affecting the quality of the images whatsoever. The matches will be streamed FREE of charge and as can be expected with a DeLierre production, "trust that during the broadcast you will see the ball clearly and will be treated to the close ups and edits you are accustomed to through our dvds and clips." To view the broadcasts a small software program must be downloaded first and currently the software streaming technology is only compatible with PC systems. "Boston is becoming the hub for great things in squash. David's addition to the Boston squash scene, coupled with our television-come-web-cast deal with Telimage Productions, the leading producer of video squash programming, affords us the opportunity to make squash accessible to larger and larger audiences" explains John Nimick, whose Event Engine sport and entertainment company is promoting the Players Cup Circuit and three of its associated tournaments. With just over two weeks to go until World Squash Day 2008, clubs around the world are registering their events on the WSD website. On Saturday 15th March squash clubs worldwide can join in the fun with a range of sponsored events. Squash teams can also improve their fitness by taking part in one of the hundreds of Sainsbury's Sport Relief Mile events taking place across the UK on Sunday 16th March. World Squash Day is endorsed by the World Squash Federation and supported by a host of national governing bodies. In previous years, events have taken place in more than 40 countries and have supported the sport's bid for a place in the Olympic Games. WSF Chief Executive Christian Leighton said: "This is a fantastic opportunity for squash clubs to enjoy a weekend of fun activities and also to get involved with Sport Relief. "All of the events held by squash clubs will be good for the game and any money raised will be spent by Sport Relief to help vulnerable people living incredibly tough lives both at home in the UK and in the world's poorest countries. "We are expecting support from squash clubs and national governing bodies all over the world." World Squash Day founder Alan Thatcher, chairman of the Kent SRA, said: "This is great news for the sport and it gives every squash club on the planet the opportunity to support two major objectives: to raise the profile of squash and to raise valuable money for Sport Relief. "It's free to get involved and squash clubs around the world are being asked to open their doors to the public, to hold fun events to promote the game, to attract new members and to show the world what a fantastic sport we have. "We will also be encouraging clubs to raise money for Sport Relief by staging sponsored events during the weekend." Comic Relief Fundraising Manager Carolynne Evans said "We are absolutely thrilled that World Squash Day is supporting this year’s campaign and that squash clubs across the UK and beyond will rise to the challenge to raise a heap of cash for Sport Relief." World Squash Day was founded following the terrorist attacks in America on September 11th 2001. A number of squash players were among those killed in the attacks on the World Trade Center, including Derek Sword, a former Scottish junior international player who was squash champion at New York Athletic Club. Several of Derek’s friends decided to create something special in his honour, and also provide something tangible for squash. Hence World Squash Day was born. Among the annual activities is a challenge match between New York and a UK team who compete for the Derek Sword Trophy, a magnificent silver rose bowl donated by Derek’s employers, KBW. Sport Relief harnesses the power and passion of sport to change lives for the better. By playing sport, having fun and raising money, everyone can do good and feel good. Comic Relief spends the money to help vulnerable people living incredibly tough lives both at home in the UK and in the world's poorest countries. In my recent post on squash in India, I highlighted the rise of the number 2-ranked player, Dipika Pallikal. However, I avoided mentioning the row that was brewing surrounding her omission from the India squad for the Asian Championships because there appeared to be so many conflicting accounts posted online. The video includes comments from the Indian National coach, Cyrus Poncha. Nicol, who is co-promoter of the event, will be appearing at the Cabot Place East Rotunda at Canary Wharf on Monday February 25 to sign autographs, answer questions and oversee special draws for free Gold Tickets. The ISS Canary Wharf Squash Classic is London's premier squash tournament and takes place at the stunning East Wintergarden event from March 10-14. All prime back-wall seats have been sold out and the only way for squash fans to get their hands on one is to register their names for the Gold Ticket draws which will take during Nicol's visit to Cabot Place on Monday February 25. Each draw will take place on the hour at 12 noon, 1pm and 2pm and the former world No.1 will pick out the lucky winners. Laureus Awards recognise "the best"
What have Dennis Hopper, Vladimir Putin and the South African rugby team got in common? They were all guests at Monday's Laureus World Sports Awards - the yearly "sports Oscars", this year held in St. Petersburg. Ok, that might be a silly question given the lack of attention the sport currently receives from the world's media.. But the awards do exist to "recognise the achievements of those teams and individuals who symbolise the very best in sport". Surely Nicol David and Amr Shabana would get a mention? "The best", however, is almost as vaguely defined here as it is in the BBC's annual Sports Personality of the Year yawnathon. 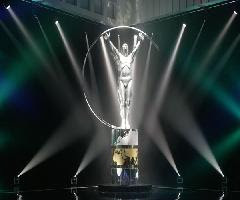 The voting process for the Laureus awards appears rigourously fair, with a selection panel of the world's "leading sports editors, writers and broadcasters" from over 80 countries voting for a shortlist of six nominations in each award category. The members of the Laureus World Sports Academy then vote by secret ballot to select the Award winners. The whole process is monitored by independent auditors PricewaterhouseCoopers LLP. Few would argue with the fact that Rodger Federer is one of the greatest sportsmen on the planet. But awarding the him the accolade for the fourth time does render the event somewhat predictable. Reference to the history of the awards shows that the winners in the major categories rarely come from sports other than tennis, football, golf, motor racing and athletics. But their absence only served to throw into relief for the north American audience what many others around the word know - that Egypt is becoming the dominant force in men's squash. With the Australian threat of David Palmer and Stewart Boswell seen off in earlier rounds, the Egyptians greedily kept the semi-finals all to themselves, with Shabana, Ashour, Darwish and El Hindi enjoying the success in depth that didn't quite pay dividends at last year's World Teams. The final saw Ramy Ashour retain his title against a "not really there" Shabana in just 38 minutes. I had hoped to finally get to see the top English players take on the top Egyptians, in England, at Canary Wharf, though only Mohammed Abbas from Egypt is confirmed to play. In the men's event, James Willstrop retained his crown after defeating Lee Beachill, who was - incredibly - appearing in his seventh National final since 2001. The 11/9, 11/8, 11/4 scoreline maybe reflected the fact that Beachill is on the way back after injury, but Willstrop's increased consistency against the top ten ranked players in the world must surely mean that this is only the second in a long line of National titles. With Nick Matthew injured, Willstrop looks set to cement his position as the top Briton over the remainder of the season. Waters - number 4 in the England rankings - looks set to rise on this position and gain on Tania Bailey and Vicky Botwright, ranked 1 and 2 respectively. Botwright withdrew from the Nationals with injury prior to the event, with Bailey having to retire in her semi final against Laura Lengthorn-Massaro with a leg injury. 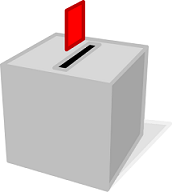 Scrutiny of the recent PSA elections has revealed that the elective process was not as smooth as the PSA press release suggested. Martin Bronstein reports in the article that there was some confusion with the way the votes were counted after the ballot in Bermuda. It appears that some of those eligible to vote are unhappy with Gawain Briars, the PSA chief executive, and Jack Herrick, a Director of the PSA and "firm supporter of Briars". In a move to strengthen player presence on the Board, Lee Beachill was up for election, which would have seen him take Herrick's place. Bronstein claims that "all the players and others who knew what was what told me that this was a fait accompli, a done deal, it was in the bag, that Herrick would be out and Beachill in." But when the count was conducted, Beachill had apparently "not amassed enough votes". This is where the Florida-style confusion seems to lie. Fast-forward a few weeks and Beachill finds himself on the Board, apparently after some votes were found after being "left in Cardiff" (good job there were no UN election monitors around - they'd never buy that). Herrick - who Beachill was destined to replace - stays on the Board after (according to Bronstein) a "deal" seems to have been "brockered". "I’ve been one of the players that have been whinging and complaining, so it's only fair that I do something about it now. There are a few other people on the board that have been trying to make some changes too, and it’s good that they’ve got an extra voice now. "I'm not somebody that can stay there and do nothing when things are not right, I just come out and say it as it is ..."
World No.12 Barker is moving from Bethnal Green to Limehouse and is sure to enjoy huge local support when London's premier squash tournament takes place at the superb East Wintergarden venue from March 10-14. Barker, the current world No.12, is moving from Bethnal Green to Limehouse in May and said: "If the tournament was two months later I could walk from home to the venue." Barker is sure to enjoy considerable local support when the five-star PSA World Series event returns to the spectacular East Wintergarden venue from March 10-14. The left-handed Londoner is enjoying the best form of his life, and warmed up for the Canary Wharf tournament by reaching the final of the Swedish Open on Sunday. He lost to England team-mate James Willstrop in a superb match and the two could meet again in the ISS Canary Wharf final. However, for that to happen, Barker would need to remove the number one seed, French ace Gregory Gaultier, whom he is seeded to meet in the semi-final. Barker, 24, admitted: "I have never beaten Greg before. I lost to him in Saudi Arabia last year and was not too happy with my performance. You know you’ve got to give everything when you play guys like him. "I was very pleased with the way I played in Sweden and I hope to carry on that form. I beat Olli Tuominen of Finland in the semi-final and that was the best I have played for months. "I felt I played well in the final against James, but everything I did he did just a little bit better. I am very optimistic about the next few months and I am really looking forward to playing at Canary Wharf. "It’s a brilliant tournament and lots of my friends will be coming along to cheer me on." Barker faces fellow Essex player Daryl Selby in the first round, just as he did in Sweden, and is scheduled to meet Cameron Pilley in the quarter-finals if the tall Australian can beat the mercurial Italian Davide Bianchetti. Barker achieved a sensational victory over Pilley as England beat Australia to win the World Team Championship in India in December. 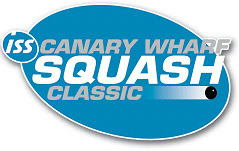 In the draw for the ISS Canary Wharf Classic, Willstrop, the number two seed, is scheduled to meet a qualifier in the first round followed by Welsh veteran Alex Gough ahead of a possible semi-final clash with his Pontefract training partner Lee Beachill. Willstrop achieved his first career victory over his Yorkshire and England team-mate at Canary Wharf last year and is bidding for a third triumph in London’s premier squash tournament, having beaten Thierry Lincou of France in the 2004 final and Scotland's John White last year. Willstrop, the world number six, is seeded to meet French star Gaultier in the final. Their rivalry goes back to junior days and their matches are always absorbing physical and mental battles. Gaultier, the reigning British Open champion from Aix-en-Provence, faces fellow Frenchman Renan Lavigne in the first round at Canary Wharf and is seeded to meet rising Egyptian star Mohammed Abbas, the number five seed, in the quarter finals. The first round draw at Canary Wharf also includes an intriguing clash between Finland’s No.6 seed Olli Tuominen and Britain’s Joey Barrington, son of squash legend Jonah. Tuominen and Barrington are both noted for their attritional styles and spectators at the East Wintergarden could well be in for a marathon match. The first round will be split over two evenings, meaning that office workers at Canary Wharf can stroll from their desks to the tournament venue in time for play to start at 5.30pm. Sadly, England star Nick Matthew has been forced to take a long rest from squash because of a shoulder injury and will not be in action at Canary Wharf. Tickets are on sale via the Ticket Hotline, 0844 847 2419, or via the website www.ticketmaster.co.uk. 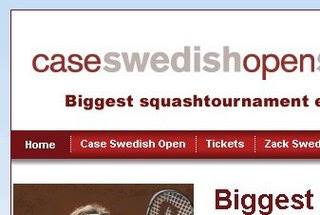 James Willstrop warmed up for the British Nationals by winning the Case Swedish Open 2008 in Linköping. The 5-star men's event, with a prize fund of $55,000 received surprisingly little media coverage (even by squash's standards! ), and its claim to be the biggest tournament in Northern Europe also raised an eyebrow, though a browse back through previous events in Britain and elsewhere failed to find a richer prize pot. 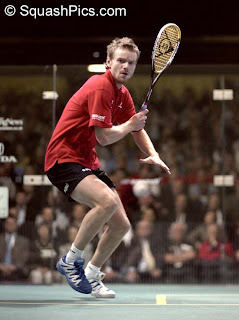 The first upset to the seedings that caught the eye was Ollie Tuominen's win over Lee Beachill in the quarters. A glance at the head-to-head results history between the players, however, disproved my assumption that it would have been the Finn's first win over the Englishman. They have only once before in competition, in the Bear Sterns Tournament of Champions 2007, with Tuominen also winning then. These wins - both recent - have happened in a period when Beachill has been in a (relative) decline in the rankings, but it could suggest that Olli's game is particularly suited to the way Lee plays (I've seen Beachill play many times, but never Tuominen). One of the other quarters saw Adrian Grant play Stewart Boswell. Grant's 3-1 victory marked the first meeting between the two, and this upset to the seedings, also coming on the back of a tournament win in the Comfort Inn Open, marks a confident start to the year for the 27 year-old left-hander from London. Grant has got a good draw in the Nationals, where he should safely make it to the semis, where he will hope his form takes him beyond the player likely to stand in his way to the final ... Lee Beachill. So that got your attention, then. Is the medical insurance firm HighmarkBCBS suggesting that squash induces heart attacks, or is the game being used a symbol of healthy living? 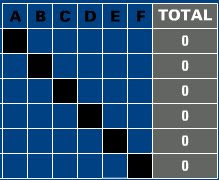 A reader has asked me if I could suggest online software to facilitate a squash league/ladder. The most popular free application (though a donation is asked for) appears to be: http://squash-ladder.net/home.php which many clubs seem to use. "With $80,000 in prize money, we have achieved super series status," says fundraising chairman David Heatherington. "This tournament is now one of the top three in North America, and it's in the top 12 in the world. It's a strong statement to the global squash community that Richmond is on the map with London, Hong Kong and New York City." Heatherington credits the influential enthusiasm of Gus Cook, squash pro at the Country Club of Virginia, for energizing the community and raising the tournament’s profile. "This draw is will be the strongest draw anywhere in the U.S. this year and probably one of the top six strongest draws anywhere in the world in 2008," says Cook, who is the tournament director. The top 12 world ranked players that have committed to play are: Ramy Ashour Egypt, world #2; Greg Gaultier, France, world # 3; David Palmer, Australia, world #4; James Wilstrop, England, world #6; Thierry Lincou, France, world #7; Karim Darwish, Egypt, world #8; John White, Scotland, world #9; Wael El Hindi, Egypt, world #10 and others. In total, eight of the world’s top 10 and 16 of the top 25 players will compete. The recent successes of Indian players in the men's and women's game has been reflected in the growing amount of media coverage the sport is receiving there. While Pakistan has always been one of squash's heartlands, its neighbour has not had the strength in depth within the professional game to compete at the same level. Dipika Pallikal is celebrated in the India Express, after winning the recent British Open under-17 title. The teenager made rapid progress in 2007, halving her ranking to begin 2008 at number 64 in the WISPA list. Both Pallikal and 6-time Indian national champion Joshna Chinappa are recipients of funding from the Mittal Champions Trust - an organisation established by Lakshmi Mittal, Chairman and Chief Executive of the Mittal Steel Company, to support and fund talented sportspersons. High-profile support and sponsorship brings greater recognition for squash players the India media than it does in Europe. Ritwik Bhattacharya continues to attract coverage in the newspapers for his behaviour both on and off the squash court. The England-based player has won 6 PSA tour titles to date, and has a high-profile sponsorship deal with Police sunglasses, which places him in the same company - but I would hazard not the same earning bracket - as David Beckham. He also appears in the Times of India after it was announced that he had split with his actress girlfriend Neha (perhaps the Beckham comparisons are not that wide of the mark ...). However it is Saurav Ghosal - currently based in Leeds - who is currently most successful on the PSA tour, lying at 47 in the January rankings. Ghosal's success also brought him the prestigious Arjuna Award in 2007. The Arjuna Award is given by the government of India to recognise outstanding achievement in National sports. The award carries a cash prize of Rs 300,000. A report on this from The Telegraph, based in Calcutta, can be read here. 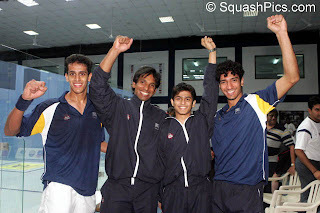 India's recent strong showing in the Men's World Team Championships, where they eventually finished 8th in the tournament, also demonstrated their strength in depth, with Siddarth Suchde joining Bhattacharya and Ghosal in a memorable 3-0 win over Wales. At grass-roots level, the country has been receiving the benefit of experience. Last year's visit by Peter Nicol to India saw the former world champion coach young players at the Otters Club as part of the World Squash Academy. However it's not all positive coverage at junior level - NDTV reports that "the problem of age fraud in sports continues to be rampant in India", with protests arising at the recent junior nationals about over-age players. 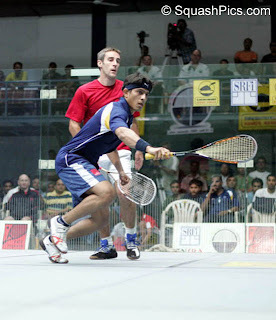 Promisingly, the growth of squash in India may also help its Olympic aspirations. Randhir Singh, secretary general of the Olympic Council of Asia, was present at the Men's World Team Championships and pledged to try and help make squash an Olympic sport. With the Commonwealth Games to be held in Delhi in 2010, India is well-positioned to provide the catalyst that could raise the profile of the game on the world stage. A government e-petition has been set up asking for the Prime Minister to include squash in the London 2012 Olympics. Squash narrowly failed to make it into the London 2012 games when the IOC, after a vote, decided not to include any new sports. It is unclear whether the PM has the power to intervene with the IOC's ruling, though it's worth adding to 105 signatories already up there!